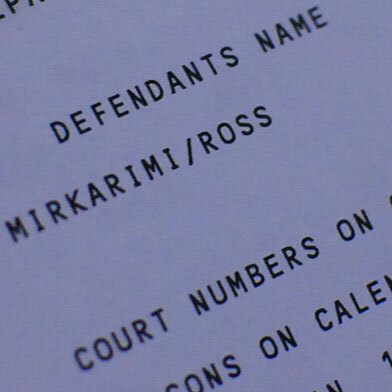 An attorney for suspended San Francisco Sheriff Ross Mirkarimi today filed a petition for a writ to have the suspension overturned, arguing in part that the crime for which Mirkarimi was convicted occurred before he was sworn in as sheriff. Mayor Ed Lee suspended Mirkarimi, 50, last week after the sheriff was convicted and sentenced in a domestic violence case involving his wife. Mirkarimi pleaded guilty on March 12 to a misdemeanor charge of false imprisonment for the Dec. 31 incident, in which he allegedly grabbed the arm of his wife, Eliana Lopez, during an argument. He was sentenced on March 19 to three years’ probation and other penalties, and was suspended by Lee on Wednesday on official misconduct charges. The city’s Ethics Commission now has the responsibility of considering the charges and making a recommendation to the Board of Supervisors, which would need the approval of nine of 11 supervisors to remove Mirkarimi from office. The city attorney also claims that another part of the definition of misconduct in the charter, “any wrongful behavior by a public officer in relation to the duties of his or her office,” also applies to Mirkarimi’s case. Waggoner also claims that suspending Mirkarimi without pay for a misdemeanor that does not constitute moral turpitude is a denial of his due process rights. In the court filing, Waggoner wrote that courts have ruled–including in a 1980 case involving San Francisco and former airport commissioner Joseph Mazzola–that official misconduct must be related to the office and must occur while the accused is in office. Mirkarimi’s case stemmed from the Dec. 31 incident, when he was still a member of the Board of Supervisors and had not yet been sworn in as sheriff. “The law is crystal clear that an elected official cannot be removed for conduct that occurred before they took office and is not directly related to their job responsibilities,” Waggoner said in a statement. “Mayor Lee’s suspension of Ross Mirkarimi violates the law in several respects and we are asking the court to intervene and reinstate him,” he said. Waggoner said he will ask the court to set a date to hear arguments on the case in the next week. Speaking at an unrelated event this morning, Lee said that today’s court filing did not come as a surprise. “We expected him to, he said he would fight this,” Lee said. The mayor said that, barring any unforeseen developments, that he expects the Ethics Commission to hold a hearing on the case in a few weeks. Lee last week selected Vicki Hennessy, a former chief deputy with the department, to serve as interim sheriff while the case moves forward.